Home>Dental treatment, Oral health>Our dentist in Armadale explain how to floss… the right way! Even if you haven’t exactly stuck to your 6-month-checkup routine, you no doubt understand how important these instructions are in maintaining your dental health. The thing is, not many people are doing all of these things properly. Our dentist in Armadale has talked about proper brushing technique in the past, as well as the types of foods you’ll want to eat more of for the sake of your dental health. So this week, we’re focusing on the third of the Holy Grail of teeth-brushing rules: the proper flossing technique! Has it been a while since your last dental appointment? Stop putting it off once and for all by scheduling a check-up with Dr Zelman Lew and the rest of the Dental Care Group team! Book online here (it takes just a few minutes!) or if you’d prefer to chat to one of our friendly staff, give us a call on (03) 9509 1500. If you don’t include flossing as part of your morning (or evening) dental hygiene routine, you’d best change that as soon as possible! While you might be able to remove bacteria, food scraps and other nasties from your teeth by brushing, the gaps between your teeth are a completely different story. Your toothbrush won’t be able to reach in between, owing to how cramped those spaces are. While brushing and watching your diet are essential parts of your oral hygiene, without flossing to round out the trifecta, you’re at risk. There’s a technique to flossing? Believe it or not, yes! Sure, it might sound like an overly complicated way of performing what otherwise is a very simple task. But once you get into a good technique after a couple of tries, it’ll fit seamlessly into your oral care routine. Despite being such a relatively straightforward procedure, a great many people seemingly don’t know how to floss properly! Maybe nobody ever taught them how to floss and they just did whatever they assumed was correct. Alternatively, it could be a situation where they were taught the wrong technique, and never learnt otherwise. Either way, the result is the same: improper flossing and poorer dental health. We understand why you might panic and stop flossing – blood can’t be a good sign. Surely, you’re doing something wrong! Ideally, flossing shouldn’t result in bleeding gums. Highly sensitive gums are a common sign of gum disease such as gingivitis and periodontitis – both of which can have dramatic flow-on effects if not addressed properly. An Armadale dentist can provide advice that helps you gradually overcome cases of gum disease. Of course, you’ll still have to floss in the meantime if you want to maintain a healthy smile! To help with that, our dentists in Armadale can prescribe alternative floss which is more suited to those with sensitive gums. You’ve just gotten up. Alternatively, you’re in a rush to get somewhere. Either way, you don’t have time to spend several minutes flossing. We get it – really, we do. But by going this fast, you risk not fully cleaning bacteria and plaque from your teeth. However, habitually rushing your flossing isn’t much of an improvement over not flossing at all! We recommend flossing each side of your teeth for 10 seconds. You wouldn’t reuse a tissue, would you? Of course not; that would be disgusting. So why are you reusing the same piece of floss? When you recycle a piece of floss, instead of cleaning out plaque and bacteria, you might simply be replacing existing them with nasties you picked up between other teeth! This one’s a no-brainer – if you don’t floss behind your back teeth, you might be leaving behind a significant amount of bacteria, plaque, or worse! We know, we know – it’s hard to reach that far back. Luckily, there are ways around that. For example, your dentist in Armadale can prescribe tools like floss holders or floss picks to get between those hard-to-reach gnashers in the back row. Is there such as thing as the “right” floss? Of course, good flossing technique is only part of the question – it’s also important that you choose the right floss. Of the two, nylon is the more common one – not to mention, it’s also significantly cheaper. However, when it comes to sheer strength, PTFE is the clear winner. Another point of difference is friction. PTFE offers smooth flossing out of the box, while nylon floss needs to be coated in wax to offer a similarly smooth experience. And we haven’t even gotten started on dental tape tiehr, which is basically a flatter, wider ribbon of nylon (one which many prefer, as it’s easier to fit between your teeth). 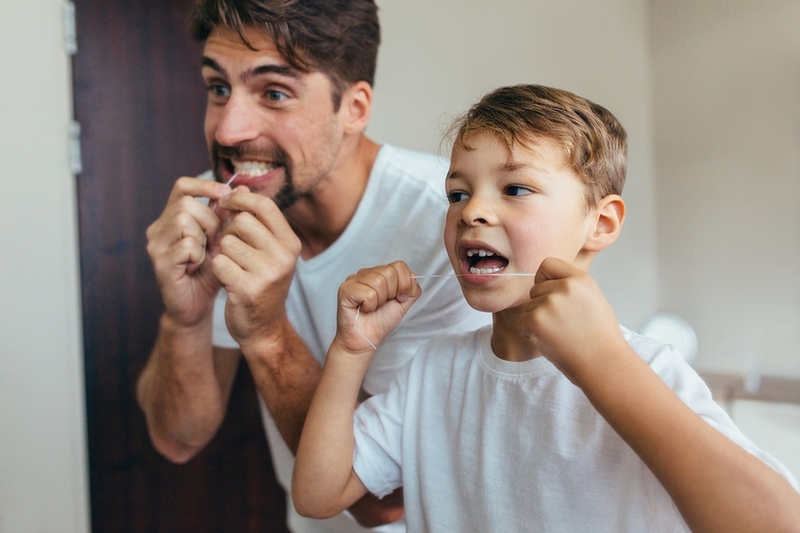 While there’s some controversy around the different types of floss, if you ask us, the ultimate worry should be personal preference and comfort. Worried about your dental hygiene? Our dentist in Armadale can help! While simple, it’s easy to make mistakes when it comes to flossing. Having trouble figuring it all out? Dental Care Group can help! Our passionate and friendly team of dental hygienists and dentists in Armadale help you understand how you can better look after your pearly whites. We’ll tell you what you’re doing wrong, what that might mean for your teeth and how you can fix it. And that includes teaching you how to floss properly. Protect your teeth – talk to a dentist in Armadale today by calling (03) 9509 1500, or click here to make a booking.